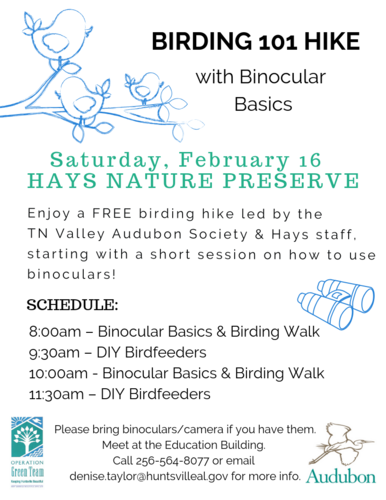 Enjoy a FREE birding hike led by the TN Valley Audubon Society & Hays staff, starting with a short session on how to use binoculars! SCHEDULE: 8:00am – Binocular Basics & Birding Walk 9:30am – DIY Birdfeeders 10:00am - Binocular Basics & Birding Walk 11:30am – DIY Birdfeeders Please bring binoculars/camera if you have them. Water and shoes that can get a bit dirty are recommended. Meet at the Education Building near the entrance of Hays Nature Preserve. Call 256-564-8077 or email denise.taylor@huntsvilleal.gov for more info.